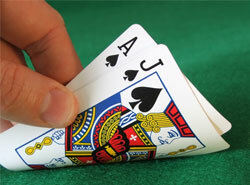 Just as with other games with cards, blackjack refers to a one-of-a-kind casino game of skill and luck. Even though no man has ever won every single blackjack game he has played, several blackjack tips are able to help players win more often. Here are some of them. Never split your 10s. Given the gaming situation, this hand already totals 20, making it excellent. Your goal would be to reach 21. However, if you have 20 as your first hand, the only way the dealer will be able to beat you is with a hand of 21. In general, this would be hard for him to do. Always split your 8s. Regardless of what hand the dealer is holding, even if he has an Ace showing, split your 8s. 16 happens to be the worst blackjack hand out there, so splitting your 8s will give you higher odds of winning one hand, and eventually saving you some money. If you win one hand and lose the other, the winning one will pay off the other, so you won't lose anything (provided you followed the regular rule requirement by placing the exact same amount for the second bet). Plus, if you end up drawing 10s for both, you will end up with two 18s as opposed to a 16, which will give you better chances overall. Never split your 5s. This will give you a total of 10, so it would be smart to just double down in order to get a single card. Think about it: splitting two 5s and getting two 10s will just give you two horrible hands and you could have gotten a 20 with a double down. When your total is 11, don't hesitate when the dealer has an Ace or a 10 showing. When your total is 10 while the dealer has 9 or below. When your total is 9 while the dealer is showing a card between 2 and 8. Double down if your total is 9 while the dealer holds a 4 to 6. When you hold soft 13s or 14s while the dealer holds 5s or 6s. When you hold soft 15s or 16s while the dealer holds a card between 4 and 6. When you hold soft 17s or 18s while the dealer holds a card between 3 and 6.